USB Image Tool is a free utility capable of creating images of USB memory sticks and MP3 players that are mounted as USB drives. With USB Image Tool you will be able to make exact backup images of USB memory sticks or switch between images with different music styles on your MP3 player. - Create image files of USB memory sticks. 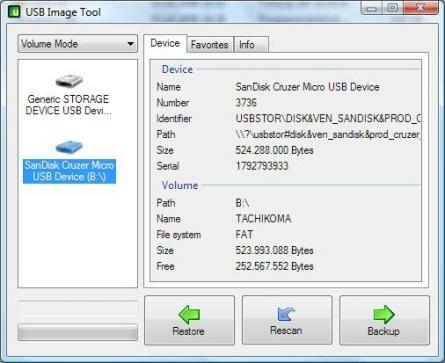 - Restore image files of USB memory sticks. - Compressed image file format. - Display information for USB devices. - Manage your favorite USB images.